We have been running a steady 3-5 trips a week here for a while and the fishing remains fair to excellent depending on what the weather restricts us to. When we can go anywhere and do exactly what we want while there we have been killing it. We have had a few days of very windy conditions that have forced us to make alternative plans and things are just a bit tougher when we have less options. 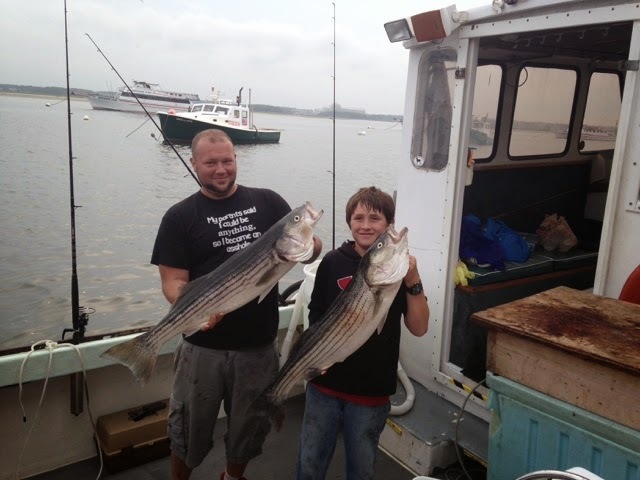 Even with the wind this past weekend we managed good catches of striped bass Sunday and Monday. Sunday we had some fish up to 37" one weighing in at 20lbs. Monday we were supposed to go offshore fishing but with the wind blowing 20-25 from the south Jeffery's was out of the question. We wound up with a nice pile of flounder during the incoming tide... We managed 30 keepers then we beat on the stripers landing another 30. Unfortunately they were mostly small and we only kept a couple. Still a lot of fun on a less than ideal weather day. We are open next week and still have some weekend trips available in August. The giant bluefin tuna are making a showing and we have a few trips booked to go try for them. Derek lost one a few days ago... The fish almost spooled him with 200lb test before he finally stopped it. I chaffed off on someone's anchor after a half hour battle which is a complete bummer but it is promising that we have seen some fish so early in the tuna season. Come get it on some of the action! Ps. 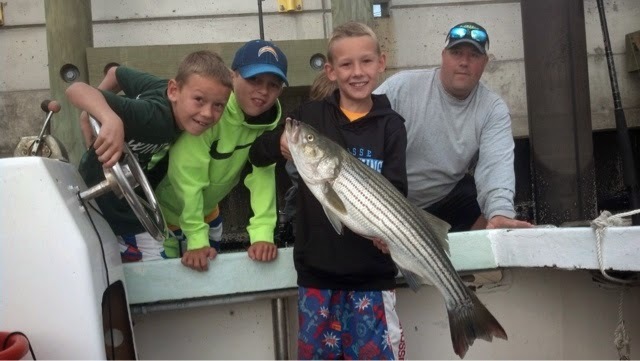 The evening striper trips have been great for people who want to fish after work! $250 gets you an evening of bass fishing in the river. The feedback and results from these trips has been fantastic!